Focusing on ten ingredients, this book will enliven and inspire the way you harvest, shop, stock your pantry, and cook for everyday meals and special occasions. 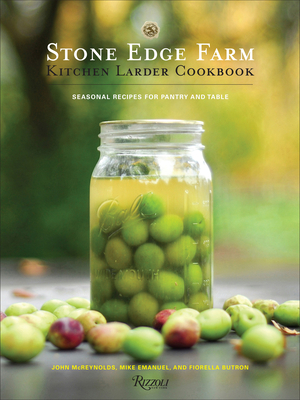 Celebrating the bounty of the estate's organic kitchen garden, groves, and olive orchard, the Stone Edge Farm Kitchen Larder Cookbook makes the ultimate gift for cooks looking for new creative and efficient means to make the most of abundance and is a thoughtful, practical inspiration for building one's own repertoire of versatile staples and resourceful dishes combining delicious and dependable larder recipes with fresh, seasonal ingredients. Divided into chapters around ten classic ingredients--Lemons and Citrus, Herbs, Garlic, Potatoes, Tomatoes, Peppers, Figs, Quince, Olives and Olive Oil, and Grapes--seventy-five delectable recipes show readers how to prepare pantry staples, such as preserves, infused oils, and conservas, and then how to use those same products and ingredients in fully composed seasonal cocktails, dishes, and desserts for family meals and entertaining. Recipes include: Warm Olives with Preserved Lemon, Stone Fruit Salad with Onions, Wild Pecans, and Black Garlic Dressing, Potato and Green Garlic Ravioli, Herb-Crusted Fillet of Beef with Red Wine Jus, and Honey Sage Whiskey Sour. Step-by-step photographs guide the reader through preservation techniques and recipes and inspire with views of finished and composed dishes and scenery from wine country. John McReynolds is the author of the Stone Edge Farm Cookbook (2013), winner of the 2014 Cookbook of the Year and Best First Book awards from the International Association of Culinary Professionals (a historic first for a self-published cookbook). He was the founding chef and co-owner of Café La Haye in Sonoma, CA for ten years and is the Executive Chef and Culinary Director of Stone Edge Farm Estate Vineyards and Winery. His recipes have appeared in numerous magazines, newspapers, and cookbooks.